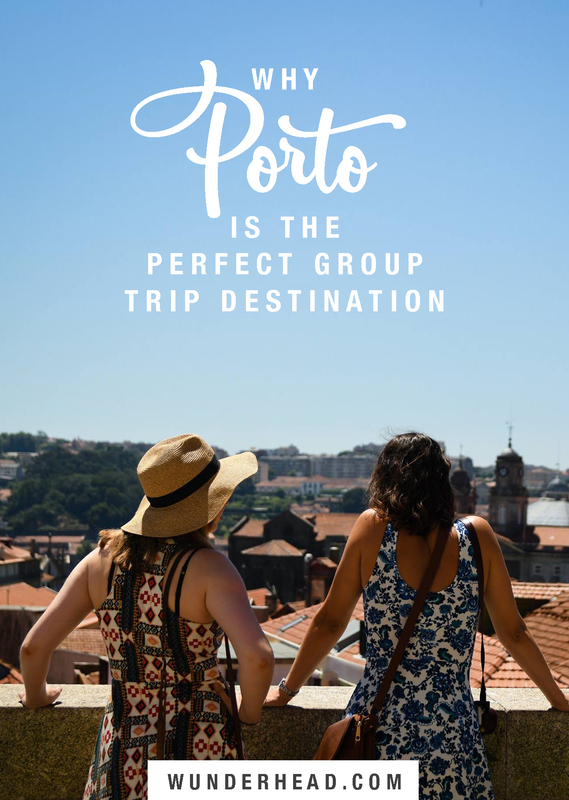 Delicious food, cheap drinks, hot sun to bathe in and beautiful streets to explore – Porto has all the ingredients you need for a fun-packed summer holiday with friends. Thanks Dan and Sarah for all the great photos! So you’ve managed to get all your friends together and find some dates everyone can do, well done you! Now you really deserve a holiday. Ideally you need somewhere with decently priced flights, with nice weather, things to do, and a big place to stay. Well hang onto your hats, I’ve got a destination that’ll meet your needs and then some. 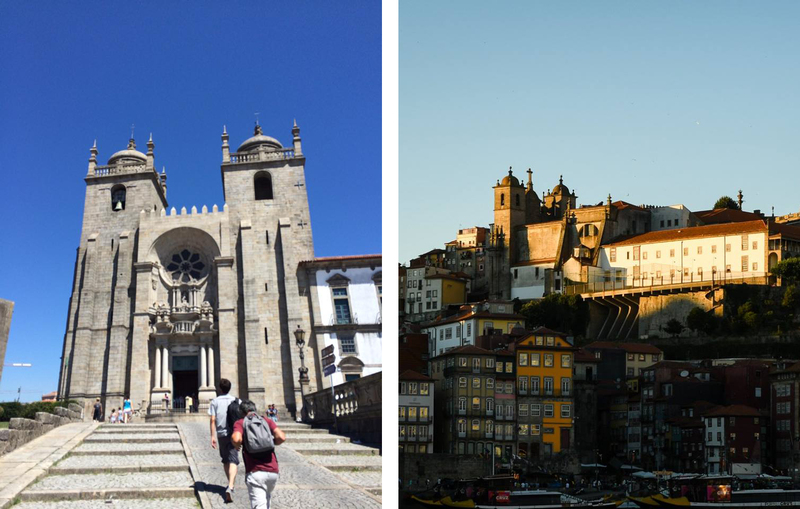 The homeland of port wine, Porto spreads out around the Douro river estuary and is the second largest city in Portugal. Its warm Mediterranean climate, beautiful architecture and delicious food make it a fantastic holiday destination, as we found out on our group trip in the summer of 2016. 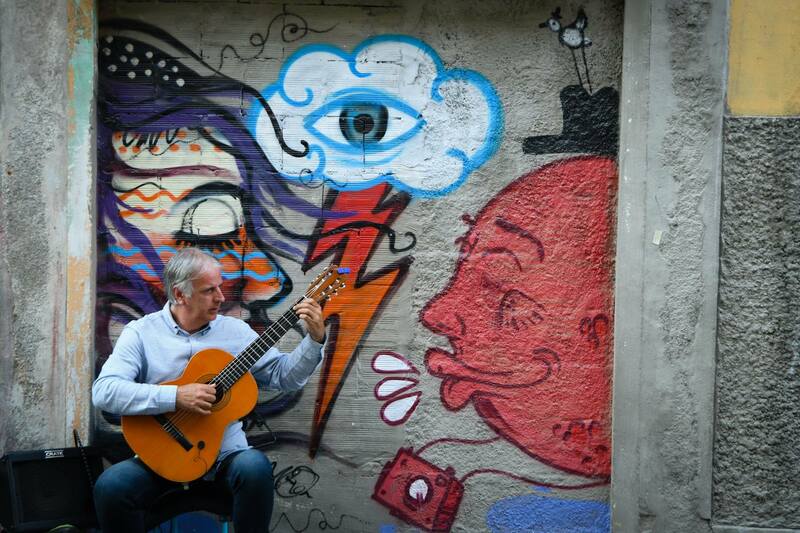 Two common sights in the city centre – buskers and graffiti. 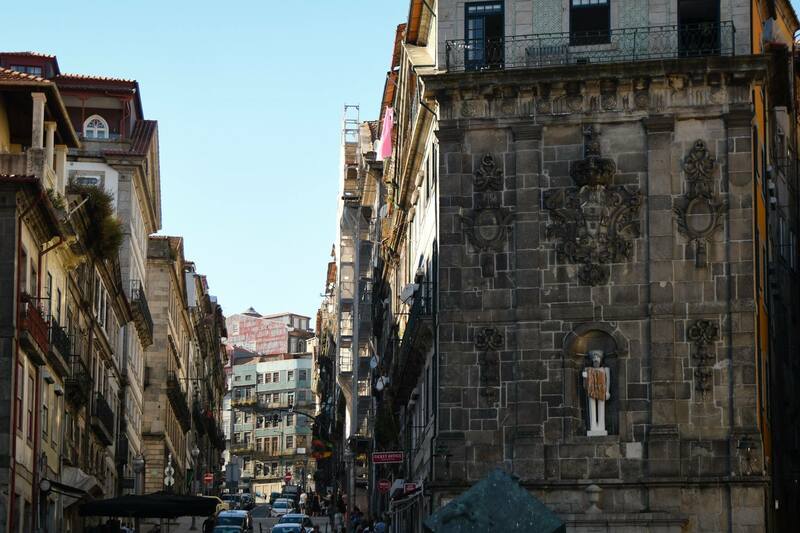 Walking down the streets of Porto, what’s around each corner is a toss up between narrow winding cobbles, wide plazas and paved terraces. If you like pretty things to look at, you’re in luck, peaceful historic churches, chaotic souvenir shops, family-owned restaurants and busy little cafes are a-plenty. Baroque, Romanesque and Gothic facades litter the medieval district. Each view point means a new photo opportunity. As Porto isn’t the largest city in the world, all you need is a good pair of shoes to climb the steep roads and explore the alleyways. 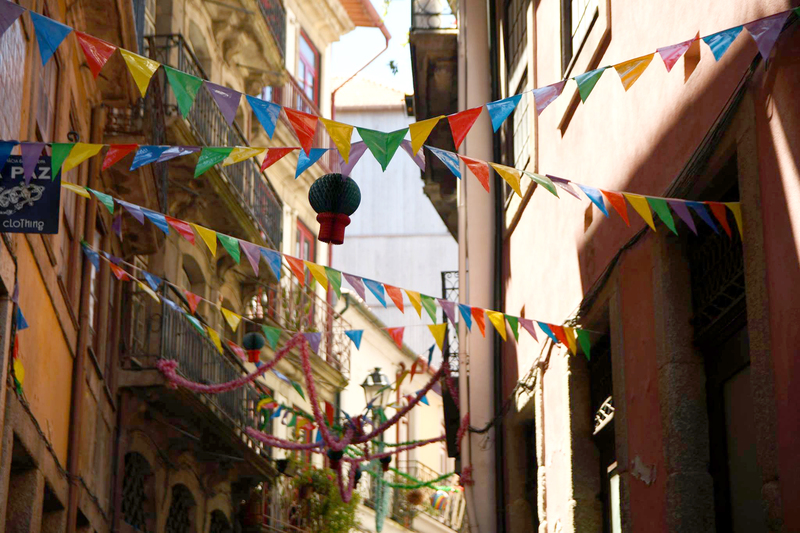 The narrow streets of the Ribeira district strung with bunting. Left: The Ribeira promenade. Right: The cobbled streets of the district. In the medieval Ribeira district (Cais da Ribeira), cobbled streets wind their way in a spider’s web towards the Port of Ribeira Square (Praça da Ribeira Porto), which admittedly is packed with tourists, but for good reason, as this whole area looks out over the Douro river to the bank beyond in a frankly unmissable photo opportunity. 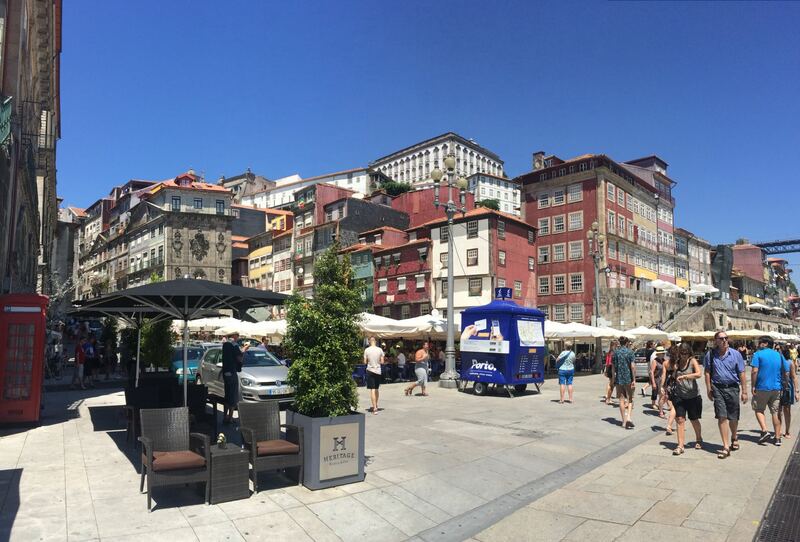 The Port of Ribeira Square (Praça da Ribeira Porto). My hot tip would be to avoid eating or drinking in this area. As a tourist hot spot, you’ll be hit with high prices and mediocre food, and you’ll also want to watch out for pickpockets and bag swipers. 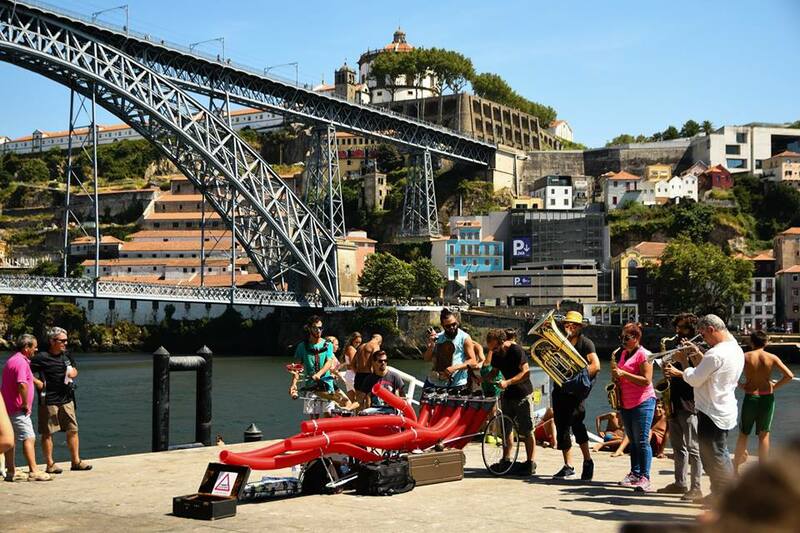 Buskers playing in front of the Dom Luís I Bridge. 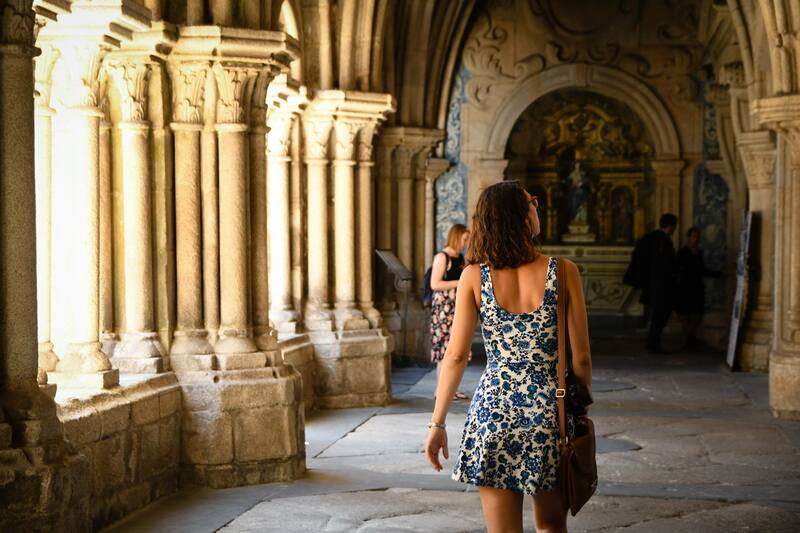 Get your group out of the scorching sun inside Porto Cathedral, the largest place of worship in the city. Found at the top of a hill in the historic centre, it’s one of the city’s oldest monuments. Left: The cathedral facade. Right: The view of Porto from the opposite bank. The Romanesque architecture from the 12th century merges with a gothic style from the cathedral’s expansion 600 years later, giving this two towered attraction quite an imposing presence. The ceramic tile decorations are called azulejos. The Gothic cloister was my favourite part of our visit, with charming blue ceramic tiles depicting scenes inspired by the Song of Solomon. Left: The swooping arches of the cloister. Right: The Chapel of the Holy Sacrament. 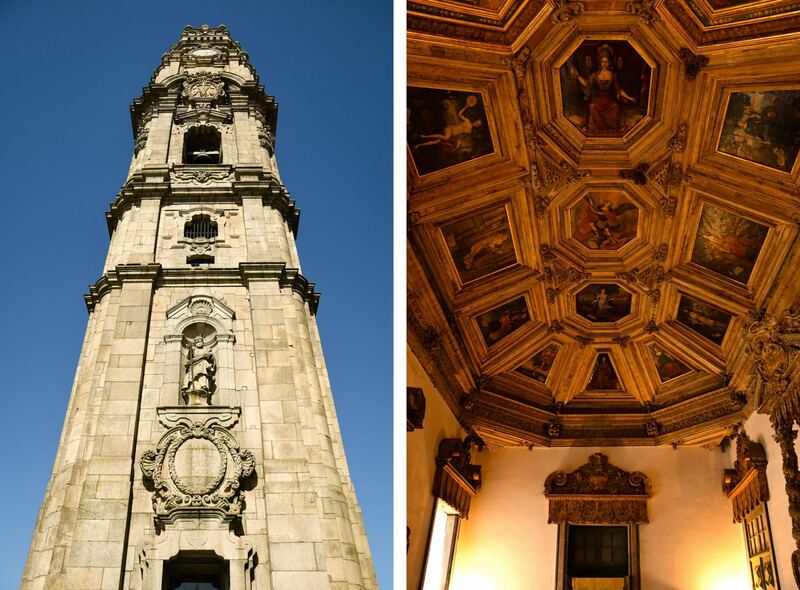 The bell tower of Clérigos Church can be seen from all over Porto, with an observation deck at the top of 225 steps offering one of the best views of the city. 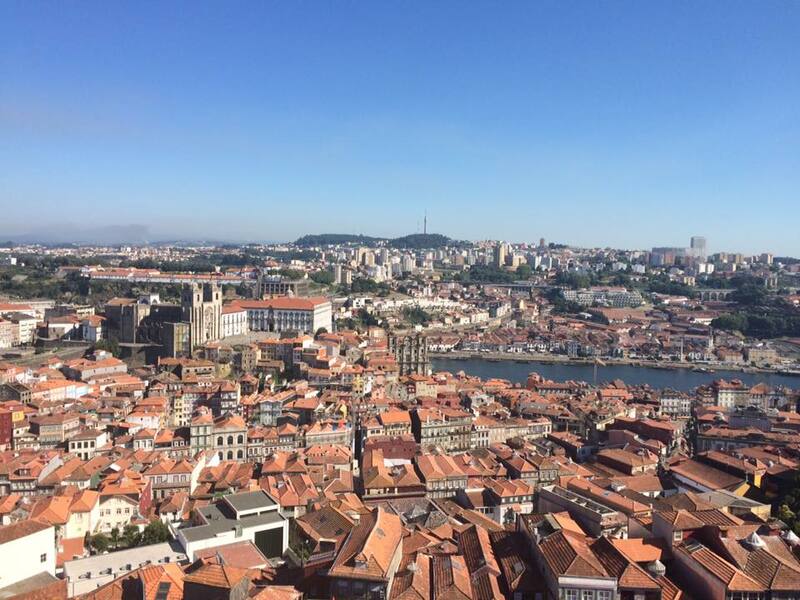 The view from the top of the Torre dos Clérigos. When it was first built, the 75m Torre dos Clérigos was so tall it could be used as a navigation point to guide ships into the Cais da Ribiera. Depending on how large your group is, it could also serve as a meeting point to guide any stray friends. Left: 225 steps take you to the top of Torre dos Clérigos. Right: Inside the baroque church. 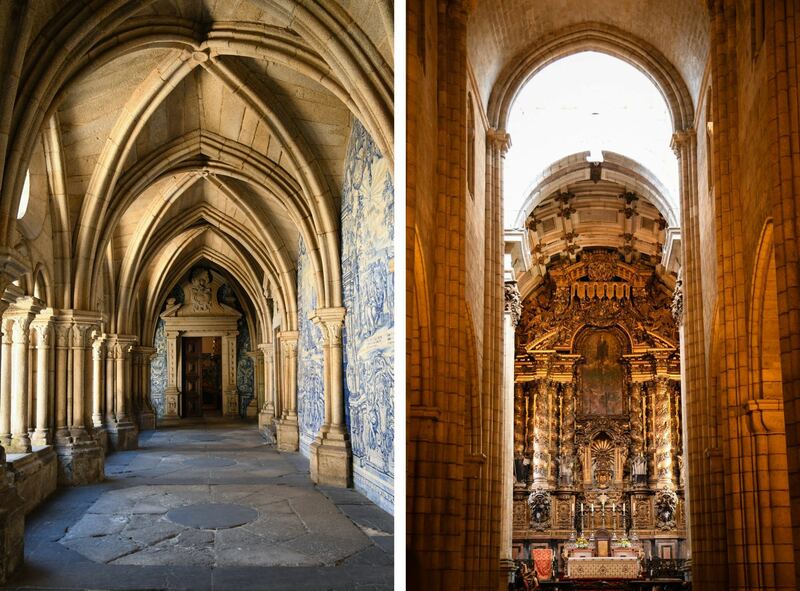 A ticket to the top grants you access to the adjoining church, with elaborate ceilings designed by the same architect and painter as the Porto Cathedral. The polychromed marble altarpiece of the main chapel. Oh my word, this book shop. Listed as the third most beautiful bookshop in the world by Lonely Planet, with a neo-gothic façade, an exquisite carved wooden staircase and a stunning stained glass ceiling, Livraria Lello had all the makings of a holiday highlight. Add the fact that it supposedly inspired J.K. Rowling as she was writing Harry Potter, and you’ve got my dream destination. Reality check: When we arrived, the bookshop was so busy we had to buy tickets to enter. Once we’d bought our tickets from the kiosk across the road we had to queue to get inside. Once we were inside we had to elbow our way through hoards of people, the dense crowds completely obliterating anything below head height. The mass of hot bodies was generating a rainforest climate of sweat. Not only that, but we were unfortunate enough to be visiting during restoration works, so the ceilings in all their stained glass glory were hidden from view. I’d give it a hard miss. If you want a more pleasant experience, try getting up super early, or visiting during off-peak seasons! Take a break! 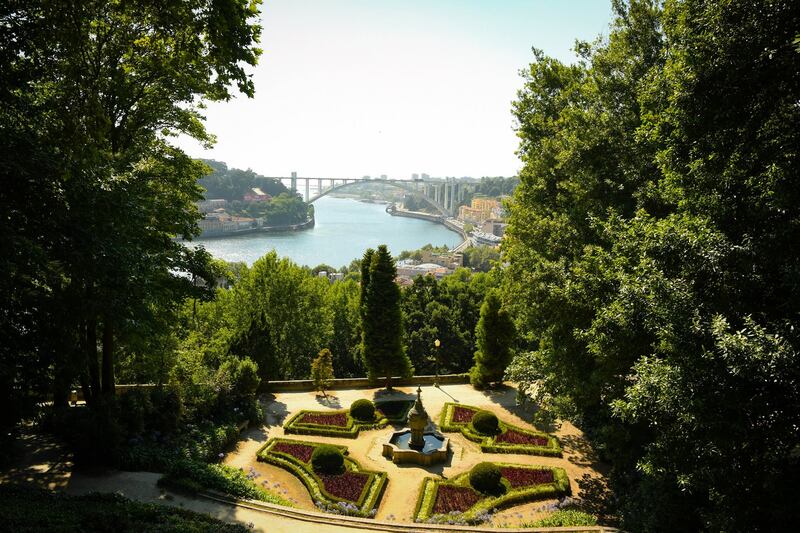 Head on up the hill to the landscaped gardens of Crystal Palace, called the “green heart of Porto”, with amazing views over the Douro river and lovely dappled shade for you to relax with an ice cream. The Pavilhao Rosa Mota or Pavilhao dos Desportos. The “palace” itself is actually a sports pavillion, which has the appearance of a slightly abandoned gig venue. The land around it includes various gardens sprawling over the hill at different heights, so you can stand at the peak and see them neatly laid out before you. The view from the palace over the Douro river. No gender roles were subverted on this trip I’m afraid – while the girls explored the Jardins do Palácio de Cristal, the boys did a tour of the Sandeman port cellars. 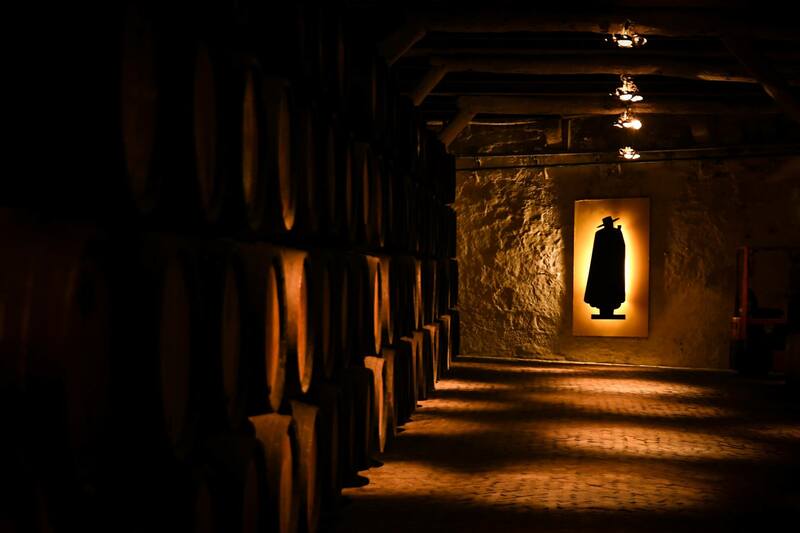 Your tour guide dresses in the Zorro-esque costume of the Sandeman logo. Here’s Matt to talk you through the cellar tour. 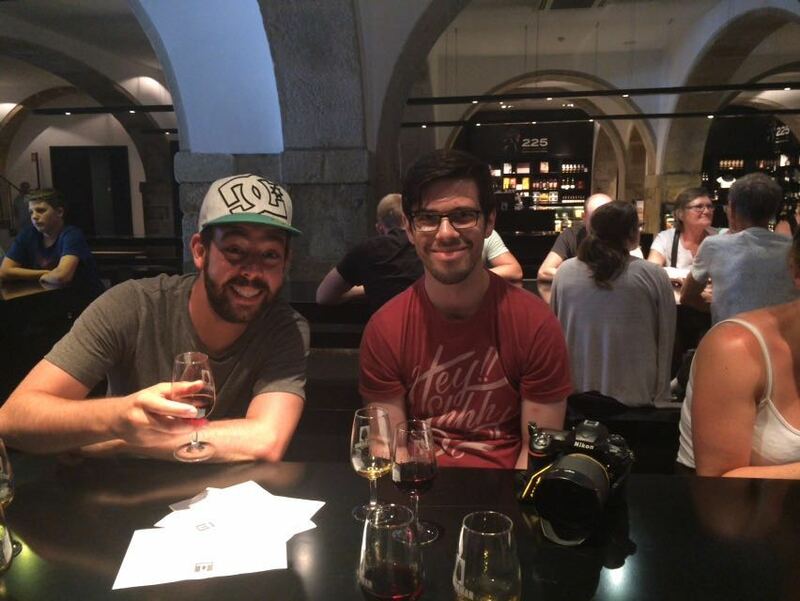 “It’s definitely worth going on a cellar tour – though I’m sure lots of the tours are similar. At Sandeman your guide wears the traditional Portugese student cape and hat, to mimic their logo. You’re taken round the cellars and shown the different types of barrels and how they relate to the way each type of port is produced – white, tawny and ruby. They explain how the purity of the ingredients and the different aging processes can affect the quality of the port. Some of the barrels are kept sealed for decades! The guide also gives you some brand history which I actually found really cool – old posters, the development of the logo etc. The terrace outside Sandeman port cellars felt like the place to be that summer, with music playing, locals chatting, a view out over the river and the opposite bank rising up beyond Luís I Bridge. It had the brand-promotion vibe of a pop-up bar at festival, but is actually open all year. Feeling like locals on the Sandeman terrace. There was a detailed menu of cocktails, all featuring Sandeman port of course. At the end of the day the resounding favourite was the Sandeman Fizz, with white port and lemon sorbet. This cool outdoor bar can be found on the grass of Praça de Lisboa, overshadowed by the tall tower of Clérigos church. This rather strange grassy square is actually on two stories, with the open green space above, and a pathway slicing through it leading to shops and cafes underneath. Base bar is a great chilled place to relax before dinner, with an extensive drinks menu and intimidatingly trendy servers (poor Pete was lightly mocked by our bearded waiter for ordering a cocktail instead of a “man’s drink”). Whiling away the time until we can go to Traca for steak. Here’s a fact you didn’t need to know: the Praça de Lisboa and Torre dos Clérigos both sit on the “hill of the hanged man”, where executed prisoners were buried in the 18th century. If you’re a steak fan, this is the place to go. 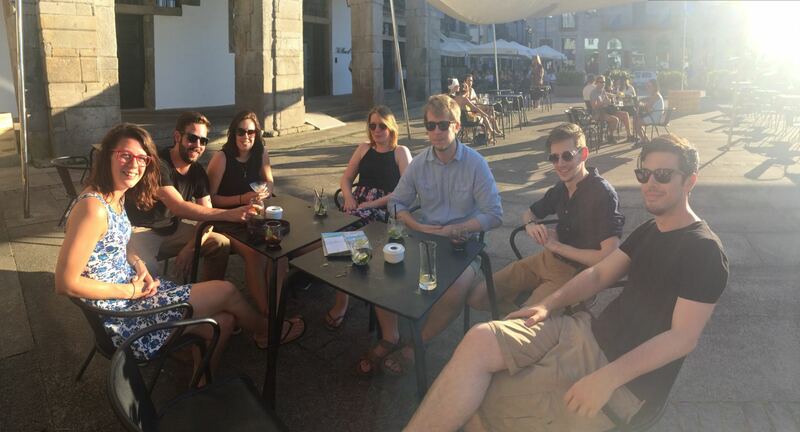 Despite the exhaustion from the hot day spent exploring Porto (can you see it on our faces? 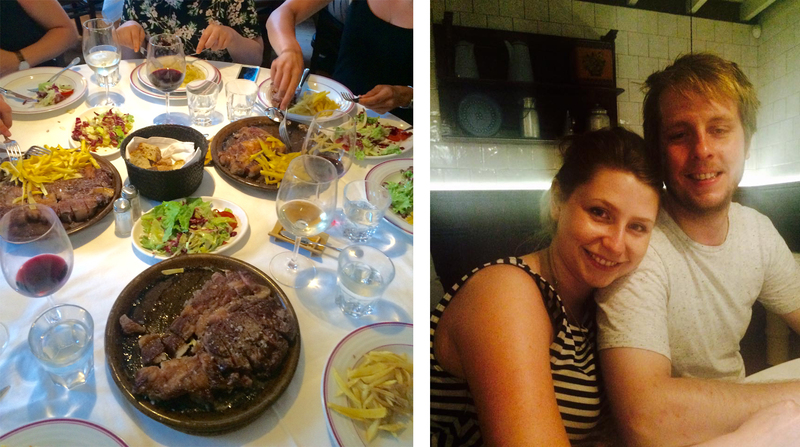 ), Traca managed to pluck up our spirits with some of the best steak I’ve ever had. 10/10 would steak again. Left: A full meaty spread. Right: Full, sun-soaked and tired. 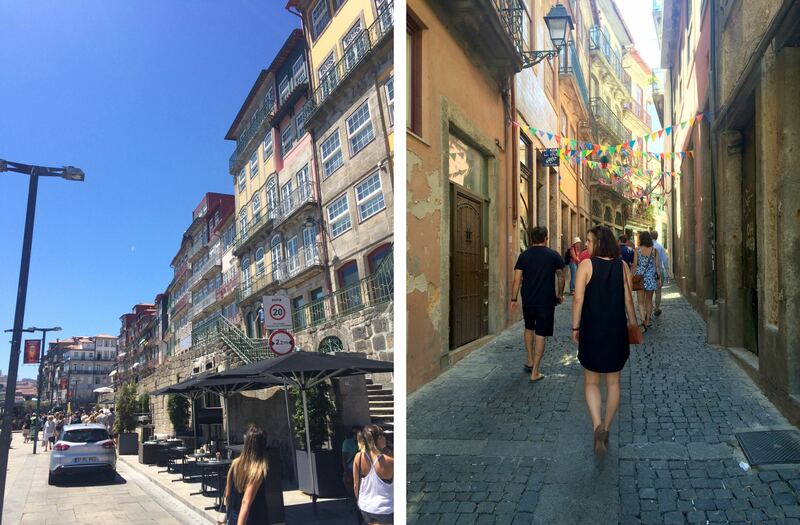 Like I mentioned earlier, Porto itself is small enough that you can walk everywhere. In terms of getting outside the city, to the beach or to and from the airport, you can get a taxi. On our trip we discovered the ubers were so cheap, we ended up using them as our personal drivers, even if it was just to the supermarket. 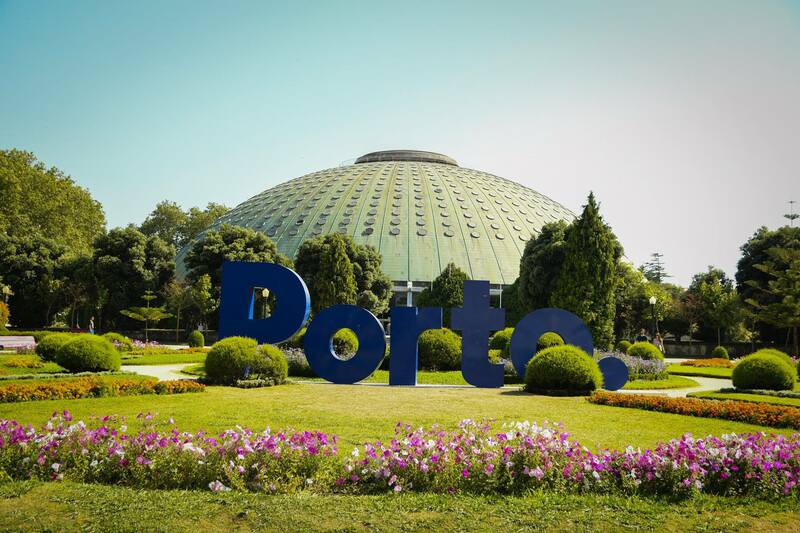 You can easily stay in the centre of Porto, but for a big group it’s probably more practical to follow our lead and find a villa or house a little outside the city. 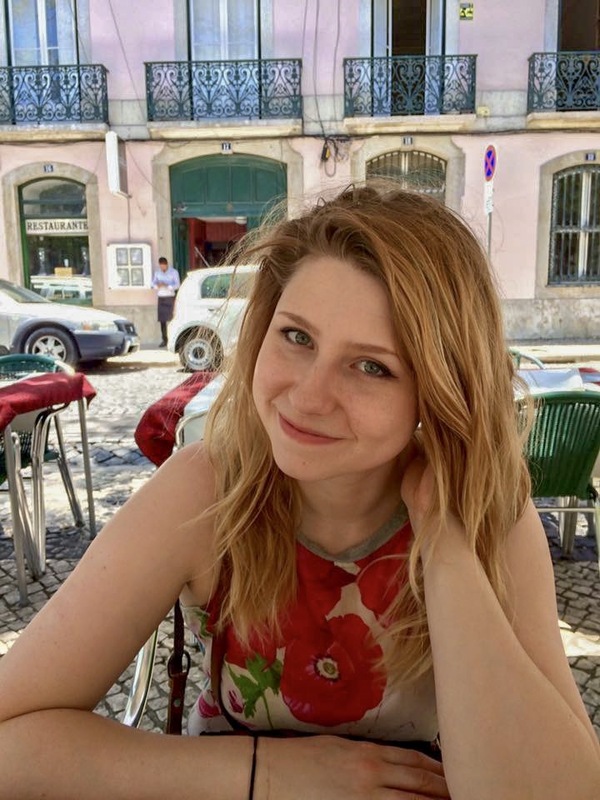 All credit here goes to Emma, who found us some accommodation in the small town of Valadares by the sea (I would post a link but it’s been taken off airbnb). The benefit of this was that we could trek into Porto for a couple of day trips, and also have time to relax by the pool and go to Francelos Beach (Praia de Francelos). Left: The med. 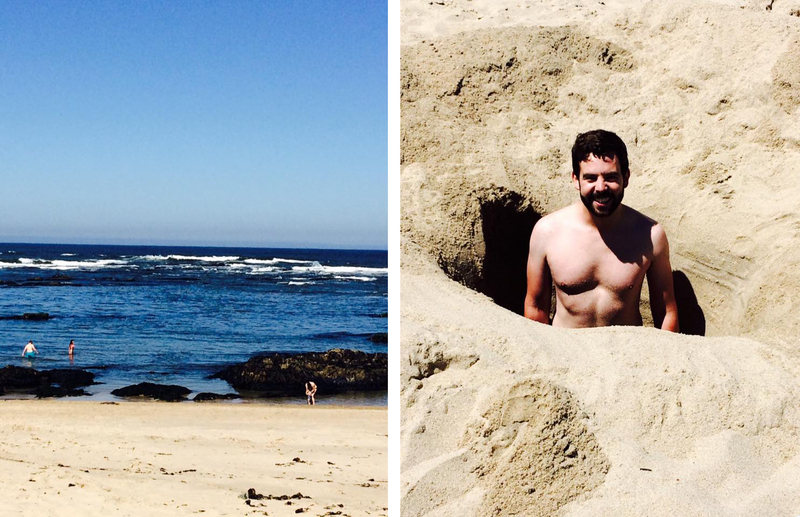 Right: Alan, “relaxing” on the beach. 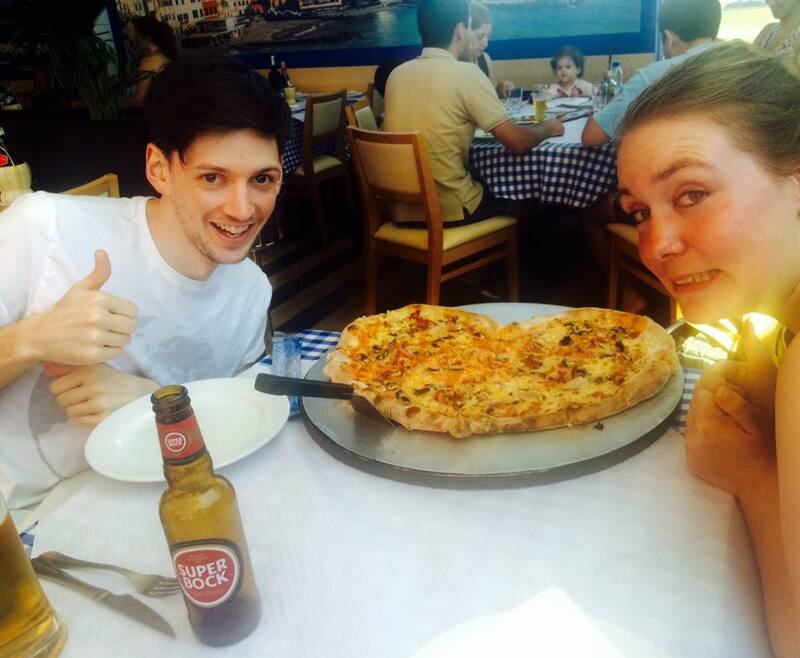 The beach was ideal for us, with a pizza restaurant to shelter in when the sun got too much for our pasty English skin. The couple’s pizza from San Martino’s is baked in the shape of a heart. We adored Porto. 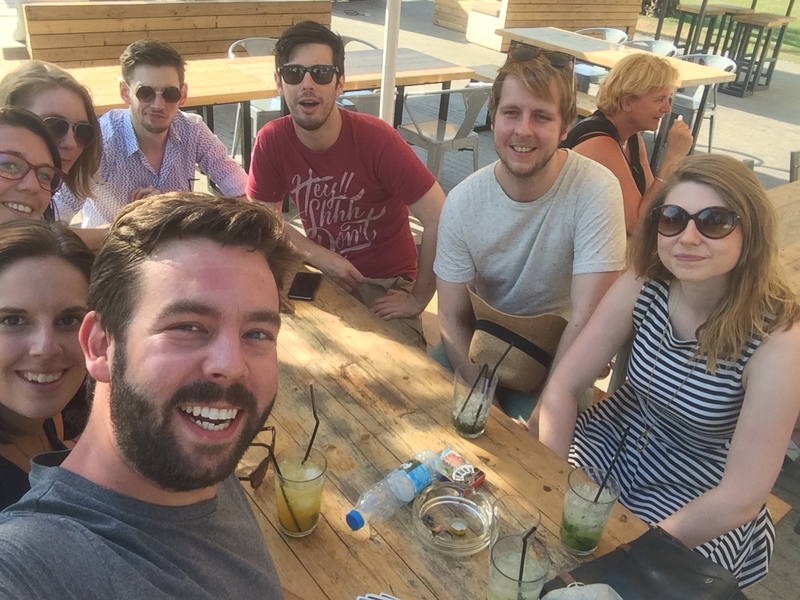 If you’ve ever been to Lisbon, it has much of the same Mediterranean charm, but in a more compact package, making it the perfect place to take a big group of people, with flexibility to go around together or split off and explore. And don’t leave without trying a white port with lemon sorbet! Glad you enjoyed my city 🙂 Love your blog!